"Attainment Of Flapperhood Is A Big And Serious Undertaking!" Many of us know "the flapper," vaguely, as a shingle-haired Charleston-dancer throwing back bathtub gin and generally defying mores in a burst of nihilistic post-War independence. We think of The Great Gatsby, or maybe one of those cheap Halloween costumes with yards of synthetic fringe and a long string of plastic pearls. But how exactly did the phenomenon start? There's a fun summary on MentalFloss that gets into the term's antecedents -the arm-flapping dancing, and a 1920 movie called The Flapper about a free-spirited young woman named Ginger - and the pop culture phenom was further expanded by the bob-haired Dixie Dugan comic strip. 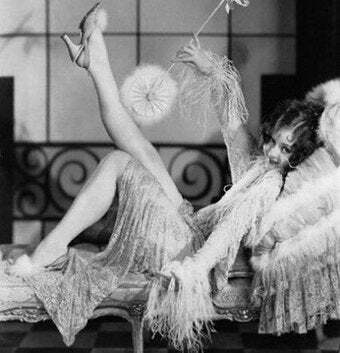 A lot of factors coalesced to create the flapper: beyond the post-war lust for life, Hollywood, with its bad girls and colorful stars, was becoming a force and giving women a whole new set of lacquered role models - perhaps disseminating trends and attitudes more quickly than in the past. Cars gave women mobility. And the country was prosperous and carefree. The straight shapeless dresses were easy to make and blurred the line between the rich and everyone else. The look became fashionable because of the lifestyle. The short hair? That was pure rebellion against the older generation's veneration of long feminine locks. Jazz, Fitzgerald and Gentleman Prefer Blondes may have celebrated a vanguard, but they were also bestsellers. And the flapper movie stars - Joan Crawford, Louise Brooks - were as popular with moviegoers in small towns as the big city. Taking swipes at the shallow-minded flappers is pretty much standard operating procedures in feminism; even Betty Friedan does it in her essay that was a run-up to The Feminine Mystique. I'm not sure what to make of that, though, because the huffy insinuation that flappers rolled back feminism through their lack of seriousness reminds me of nothing more than the same accusations being aimed at third wave feminists, who are routinely accused of being oversexed fluff-heads who are too busy enjoying our freshly won freedoms to worry about continuing the fight...It might be true to an extent, but since I see these things as cyclical, I have to wonder if the "women party down with their new freedoms" part of the cycle isn't a necessary one for a progressive movement to stick, and more importantly, move forward. Without the drinking, smoking, and most importantly, fornicating flappers pushing young women to grab ahold of the more sensual pleasures of life, how would the long-evolving sexual revolution of the 20th century get underway? I want to beg all you parents, and grandparents, and friends, and teachers, and preachers—you who constitute the "older generation"—to overlook our shortcomings, at least for the present, and to appreciate our virtues. I wonder if it ever occurred to any of you that it required brains to become and remain a successful flapper? Indeed it does! It requires an enormous amount of cleverness and energy to keep going at the proper pace. It requires self- knowledge and self-analysis. We must know our capabilities and limitations. We must be constantly on the alert. Attainment of flapperhood is a big and serious undertaking! Books references: Dorothy Parker: What Fresh Hell Is This?